Glaven, Flaven, Moyheven, it's Professor Frink on “The Simpsons” Season 16 Blu-ray! 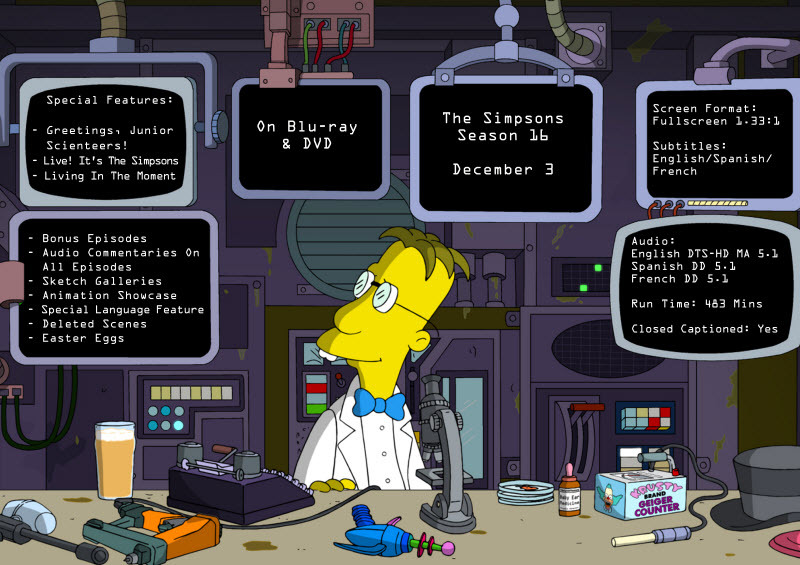 Glaven, Flaven, Moyheven, it’s Professor Frink on “The Simpsons” Season 16 Blu-ray! Hey Simpsons geeks! I have a great giveaway for you just in time for the holiday season! The 16th season of “The Simpsons” is coming out on Blu-ray and DVD on December 3rd, and you’ve got a chance to win a copy here! Have you seen the limited edition 3D collector’s box? We try to pick these ones up as much as possible, and judging by the way our 3 yo nephew keeps zeroing in on these cases whenever he visits, he loves them too! And if you’re a fan of celebrity guest stars, this season has quite the list of guest voices! Including: Fantasia Barrino, Jason Bateman, Gary Busey, James Caan, Stephen Hawking, Eric Idle, Jane Kaczmarek, Lucy Liu, Liam Neeson, Amy Poehler, Ray Romano and plenty more! Dude, Gary Busey voiced for The Simpsons! I’ve got to ask TheHubs which episode(s) this was, lol. And what’s a DVD without special features? I love Eric Idle and Monty Python so um- I’m looking forward to his guest spot! The special bonus feature on the DVD that I like is this: Deleted Scenes. Liam Neeson is the guest actor voice that I most look forward to hearing. I am most interested in the Special Language Feature (Pranksta Rap), partly because I have no idea what it might be! Steven Hawking as a special guest would be great to witness. Bonus Feature – Deleted Scenes of course! also the Bonus Episodes. The deleted scenes definitely intrigues me the most! I look forward to Amy Poehler! I am most interested in the deleted scenes. I love seeing what they decided to cut out of an episode. I am excited to hear Amy Poehler’s voice and hear what her character says. I’d love to see the deleted scenes. I’m a big fan of Jason Bateman so I’d be most interested in hearing him. Love to watch delete scenes. Gary Busey, James Caan are not who I would expected but love them (voices). • Deleted Scenes — is that intrigues me most! Bonus Episode – Holidays of Future Past seems like a great bonus feature! I look forward to hearing Jason Bateman as a guest voice the most.